Browse: Home / 2017 / December / 22 / Major Blow To ‘Energiewende’ As Top German Economist Shows Plan Can Never Work! Germany’s once highly promoted “Energiewende” (transition to green energies) and the country’s feed-in act have been given a grade of “F” by one of the country’s top economists, Prof. Dr. Dr. h.c. mult. Hans-Werner Sinn. Top German economist Prof. Dr. Dr. h.c. mult. Hans-Werner Sinn says supplying Germany’s energy needs with wind and sun is “disillusionment”. The basis of his presentation is a recent paper appearing in the European Economic Review: Buffering volatility, A study on the limits of Germany’s energy revolution. Chart: Prof. Hans-Werner Sinn, cropped here. However those turbines delivered on average only 5.85 gigawatts, well under 20%. Sinn’s results are a major blow to the proponents of the German Energiewende and to the notion it is clean, cheap and reliable. As the numbers and results come in, it becoming increasingly clear that the German mega green project is turning into an embarrassing fiasco. Even if Germany installed enough capacity to make its supply 100% green, 61% of the output would have to “scrapped” because there would be no use for it, Sinn shows, using a chart at the 55-min. mark. Sinn also notes he believes the cost of the Energiewende will end up far exceeding the earlier government estimate of 1 trillion euros. Moreover he says that Germany is also transforming its idyllic landscape into a large industrial park. The Energiewende is one green plan that is backfiring spectacularly on a scale few could have imagined earlier. And in typical German fashion, leaders refuse to acknowledge this and appear as if they would prefer to see the country descend (once again) into ruin before admitting they’ve erred. This is one presentation that needs to be made in English in other countries that are gung ho on going solar and wind. I wonder how the sebs and sods out there are going to handle this one. Oh wait, Prof. Sinn is just one of those “angry white men” who doesn’t have a clue as to what he’s talking about! Yes, the Professor is clearly a capitalist, Trump-loving, racist. Blinded by his prejudice against the clear advantages of renewable energy. If we want to step out of coal and nuclear power, Prof. Dr. Dr. h.c. mult. Sinn says, “then only wind and solar electricity is left over for us”. We can fill the gaps left by “fresh” solar and wind electricity using cogeneration of electricty (and heat). The fuel may be fossile in the next years, but later will be replaced by e-gas from power-to-gas installations. Mr. Sinn quotes today’s (enormous) costs for this energy path, but cost reduction by scaling up from lab level will be enormous as well. Of course Prof. Sinn is right with some critical details about the Energiewende. But they have to do with politics, not with technology or economy. what is the offical goal of energie wende? A Buffalo talk-show host just yesterday said that he’d spent a decade at a military base in Germany and he could never find a German comedian. I think you just proved him right. They will have to get one heck of a lot more RELIABLE. He is correct to say..
And for such little actual gain. Common sense will always be an anathema to you, seb. First, who is saying what? Second, have you even watched the video? I endured to the whole Sinn ordeal … he has an interesting way to twist facts, use old data and not going far enough with his “calculations”. For example, you can easily show that using batteries for short-term storage and methane for long-term seasonal storage is possible (he is even acknowledging the latter one) and price trends wouldn’t make it nearly as expensive as Sinn is suggesting it would be. But ok, everyone has an opinion. Any chance you’ll comment about what David MacKay says in that video? I don’t think you need to be told that we know that it’s not going to be easy and we are only at the beginning of the exponential curve. We’ll see how this develops and can look back in 10 years or so from the backseat of our self-driving cars drinking some “Glühwein”. I generally like your comments. You are polite, clearly know your ‘stuff’ and it is good to have a devil’s advocate in this blog. Also, its fun to see Andy to go berserk at times. This is one lame comment though, and yes, I have endured all of Dr. Sinn’s presentations on the subject, link below, starting with the famous ‘Energiewende ins Nichts’ of 2013, as well as David MacKay’s presentation. Nobody argues otherwise. A lot of things are ‘possible’, even Claudia’s druckluft scheme (maybe even the adiabatic version). The problem here is that it just does not make sense. Gratuitous remark. How many P2G installations have been built and what is the price trend? I know of one 5MW converter, built by a car company I think. A long, long way from the terawatts required. – ‘I don’t think you need to be told that we know that it’s not going to be easy and we are only at the beginning of the exponential curve’. Ha – realty shines through. Still, what exponential curve? Batteries? Windmills? Just like Moore’s law? A lot of things are possible, indeed. The problem with Sinn’s thinking is that he is always just presenting a single solution and not a combination of multiple solutions. So yeah, pumped storage won’t work (there are batteries and the get cheaper fast), methane storage will be expensive (but what will be the percentage of energy we need to actually store this way? He doesn’t care to do a calculation for that). And so on. Of course the future doesn’t look so good when you approach the problem like this. Trends: batteries and renewables in general are getting cheaper and cheaper. Regarding P2G there is no real trend visible since that technology will be needed once enough renewables are available for storage. 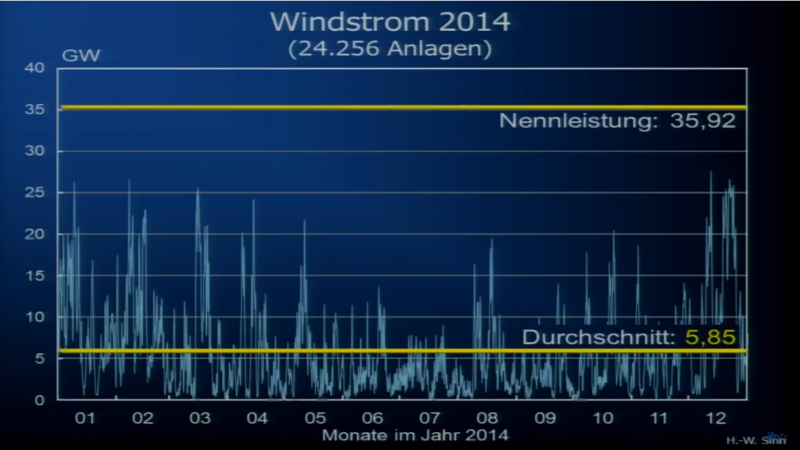 According to Sinn that won’t be the case even when we double or triple the currently installed solar/wind production. We won’t need terawatthours of P2G installations either. “Just” a few GWs of P2G plants which can store their gas in the network (even Sinn admits that this would be no problem) and enough gas power plants to convert it back to electricity when needed. Very similar to Moore’s Law, but called Swanson’s law. After around 10 years we are still just at the beginning. HE left those deposits for mankind to use. Tis the season to be very thankful, seb, because your modern inner city ghetto basement would not exist without that coal and gas. I think they are a waste of time and space. Think of me over Christmas, little trollette, as you consume lots of fossil-fuel-delivered, CO2 grown food items. And its coming from someone way, way more intelligent that you will ever be, even if you do eventually grow up. Sinn’s facts are straight and correct, sorry they hurt your anti-science point of view on everything. No, you were mindlessly seeking attention, as always. The two statements are totally correct. Get over it. Why is it that computer programmers are so often TOTALLY UNABLE to comprehend even the most basic form of REALITY or COMMON SENSE? They live in an alternate non-reality. ! But lets be honest, there are many that get so wrapped up that they think their computer programs actually produce REALITY, where even the most validated engineering computer programs are still only giving an estimate. In case someone tries to impersonate him (a la Peter Gleick), we can always refer to him as “The Original Sinn”. Looking forward to getting your colouring book? Hi Pierre, thanks for all the amazing work you’re doing here. And wishing you and yours a very merry Christmas and a happy new year. I’ve been on a slightly different track at Kiwithinker. As you very likely know, being a mechanical engineer, power system stability is about power balance. Ie the power balance between that being injected into the grid and that being taken out. Which is why of course wind and solar are not helpful in regards to stability. The sole purpose of governments is to do what they ‘know’ is best for ‘their’ people. This is achieved by taxing everything and then doing everything they can to completely waste it. They particularly like to do BIG stuff and the bigger the better. Here we have a perfect example of their incompetence. For now, his Wiki page is quite impressive. Probably a good idea to do a few screen captures before the “climate truth brigade” gets to it. Wind and solar in Germany has replaced declining nuclear. ‘has’ replaced declining nuclear? Minute for minute, day for day, week for week, year for year? Well obviously wind and solar are no substitutes for base-load nuclear, but the point is the overall wealth jobs etc. 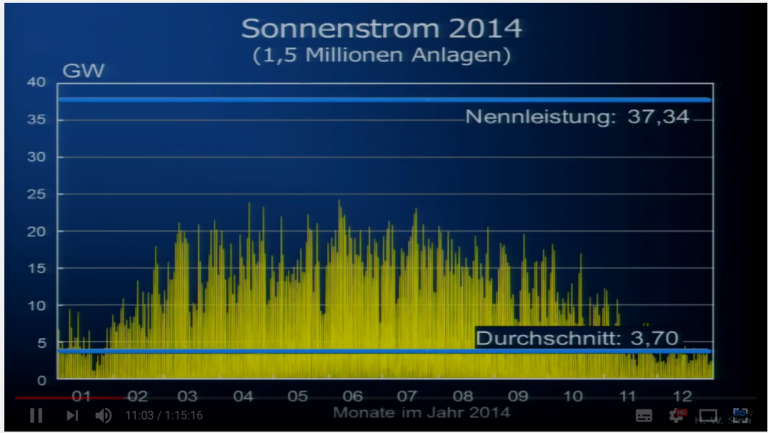 sacrifice of Energiewende in terms of replacing fossil fuels has been utterly pointless so far. “Due to the damaging effects green energy has had on Germany’s grid, the government plans to cap the total amount of wind energy at 40 to 45 percent of national capacity, according to a report published last month by the German newspaper Berliner Zeitung. By 2019, Germany will get rid of 6,000 megawatts of wind power capacity. Can’t always kill every single messenger just because you don’t like the news they bear, Seb. That’s a sign of weakness. Anyway, Merry Christmas to you. How “fact checking” works in the snopes-esque world. If I disagree with it, it’s not a fact. If I agree with it, it’s a fact. So you think the author of that “sea level data is fake” paper is on to something then? Not making up his own adjustments without justification? Not a notorious climate change denier? So in turn, you’ll accept everything I can find on the internet too, because hey … who care who the author is and what he is basing his claims on. Let’s believe it anyways until someone cares to fact check it, right? When will you learn that it is not about disagreement? When you claim that 1+1 is 3 then it’s wrong, Nita different opinion, not wrong because someone disagrees, wrong because it is objectively wrong. Just make it up to agree with your brain-washing. Sorry you were not able to understand the sea-level data. But not understanding is an art-form to you. Have you got anything except EMPTY mindless waffling, seb ??? Seb .. meaningless and empty…. as always. Nicely presented. Unfortunately, he is perpetuating a few myths and assumptions that do not hold water. But on the positive side first, he concludes that 50% PV & Wind in Germany are possible with only small losses due to peaks not needed in the power sector (54:00). Including other renewables that means 61% renewables in the German pwoer sector are quite feasible according to Mr. Sinn. So first conclusion: no need to slow down investment in new PV and Wind capacity until we are roughly at 3 times the 2014 installed capacity. At 70% PV and wind, so at 81% renewables in the German pwoer sector, we would only have to “throw away” 28% of PV and wind generation. With falling prices that might even be acceptable. But do we have to throw such peaks away? Or can they go into the heat sector, displacing 1 kWh of gas with 1 kWh of “excess” power. Efficiency power to gas in this way equals 100%, cost ist at 50 Euro/kW for resistance heaters in heating or CHP systems. If excess is present for more of the time they would warrant the investment in heat pumps. With those 1 kWh of excess power is turned into 3 to 5 kWh of saved gas in the heating sector. The saved gas from the heat sector can later power gas turbines to fill in the holes. On the path with heat pumps the 3 to 5 kWh of saved gas can be turned back into more than the 1 kWh of power spent upfront. – electrification of heat and mobility must replace the same amount of end energy (power or fuel as bought by the customer). Due to higher efficiency (e mobility only needs 1/3 the end energy, heat pumps need 1/3 the end energy). With electrification the end energy use of those sectors shrinks significantly. Overall he ist talking up the problems and ignoring a lot of the solutions. Not that it is not right to talk about the challenges, but his conclusions are far too quickly “difficult, so can’t be done”. P.S. : There are many more small things, where he is not up to date with todays thinking and technology, e.g. wind turbines must be lit at night, for which solutions have already been found (sensors detecting aircraft at the relevant height to switch on the lights only when necessary). Jochen, as “an independent entrepreneur in the photovoltaic sector”, I’m sure you would love to see Germany swamped with solar farms. Nothing you do will make even the slightest difference to anything, climate-wise. But at least you will “feel good” about it all. I have been reading and enjoying comments by AndyG55 LONG before the barnacle calling itself “SebastianH” attached itself to the hull of HMS Pierre Gosselin, and likely will continue to do so long after that crustacean has gone. Our Christmas wish is that seb will one day provide some actual relevant content or actually find something worthwhile to do with his life. Santa cannot do miracles, though. outstanding contribution the fundamentals of regenerative power can only be supplied by organic fossil, where the technology by the petroleum majors, will over-ride renewables and disrupt the green hope of blotting our landscapes with a perpetually useless energy resource where the fundamentals destroy our global living standards with archaic 1800’s posihumerous innovation.!!! There is a real-time experiment going on on ‘El Hierro”, a Spanish island in the Atlantic. This experiment is being analyzed monthly in excruciating and grim detail by Roger Andrews of the ‘Energy Matters’ blog (link below) since becoming operational a few years ago. El Hierro was touted at the time as ‘becoming energy self-sufficient’ (not just electrical, mind you) and diesel fuel supplies from the mainland ‘a thing of the past’. El Hierro’s population is roughly 10,000 (in HouseHold units, about 2,500 HH)and a yearly use of 45MWh. Eighty-some million Euros were spent on five Enercon direct-drive (no gearbox) windmills with a 2.5MW ea nominal capacity, a pumped hydro storage plant with about 10MW generating capacity, 6MW worth of pumps, an upper reservoir at 900 m altitude capable of storing 260MWh when full. The lower reservoir is only half the size due to soil stability reasons. Elon Musk’s Super Lithium Biggest Ever Battery in SA @ 50 million bucks is capable of storing 150MW so it seems El Hierro got a bargain with all the other hardware thrown in. In a good month, about 40% of the electrical power of El Hierro is Renewable Energy (‘wind’) supplied. Most of the wind energy is wasted by pumping water around and around without generating energy. El Hierro does not have the luxury of dumping excess power on the neighbors, like Germany, and so make believe it is not wasted power. Its wasted. The basic problem with the scheme, and El Hierro is an excellent representation of larger schemes such as the much vaunted ‘Energywende’, is that it lacks sufficient storage. To be anywhere near self sufficient for electrical power, the upper reservoir should be about 20 times larger. The operators of the hydro plant have obviously recognized the futility of the situation and the current water fill is only about 150MW, or about as much as Elon’s SLBEB. Water on El Hierro is desalinated seawater and expensive. Imagine that for a population of 10,000 people (2500HH) twenty SLBEBs would be needed for 100%RE and scale this up for Germany. Without cheap storage or better yet, zero cost storage, wind/solar RE is not going to work.There is very little of that on the horizon. P2G? Sure – waiting for random excess peaks on top of inherently random windpower with hellishly expensive installations @ 30% efficiency? Hundreds and hundreds of Goldisthals? There are nowhere that many adequate sites. Battery ‘breakthroughs’ from the various universities, research institutes etc? Rent seeking. Better keep some nukes going after 2022. . . .
Maybe I’ll see you at the ‘Energy Matters’ blog. Very nice summary, K. Pool! I have been following the whole El Hierro charade since it started. If it is not possible to get to 100% RE on a small island, with very well defined parameters, relatively predictable trade winds and a topography made for pumped storage, where would it work? The number of power sources on the island have been tripled by adding a hydro plant and windmills to the existing diesel plant – it does not get the system to anywhere near 100% RE. It shows up the single most important glaring deficiency: adequate storage, which will doom the whole ‘100% wind/solar’ cult. For xxxx, fill in batteries, windmills, P2G and whatnot. Hmm, we are at 38.3% in Germany for the year 2017 (https://energy-charts.de/ren_share.htm?source=ren-share&period=weekly&year=2017), 25% is wind+solar alone and Mr. Sinn above is correctly saying that we don’t even need storage before installations double or triple. So even if hydro and biomass remain where they are we’ll arrive at well over 60% renewables before storage becomes an issue. What is the renewable share on that island? That should be always true, just as the Sun is always shining somewhere. The question is whether or not transmission loss is too high to get the electricity from that somewhere to where it is needed. It rarely does and solar panels are bound to reach prices just above the cost of the resources used eventually, like any commodity that gets mass produced. Definitely not as much as Mr. Sinn is fantasizing about. For starters, we need zero storage today. Eventually, batteries will become cheap enough to be used for ensuring grid stability and eventually demand for storage will increase enough to make building big battery storage facilities economical (meaning the batteries get actually used on a daily/hourly basis). More affordable EVs – even from Tesla – are being produced/sold right now or will be available in the next years. Big car manufacturers expect large parts of their products to be electric in the mid 2020s. So you don’t think that is the case? The trends from yesterday won’t continue tomorrow? 2017 is the pinnacle of battery, windmills, P2G, solar, etc production? No further development from here on out? Or is it not the end, but the end is near? That is indeed BS, who is saying that? With transport and heating switching to electricity the demand will almost certainly increase. What we don’t need is this much primary energy consumption. It can be done much more efficient and it probably will be done. No amount of “skeptics” trying to convince the world that technology can’t solve anything and we need to continue using steam generators forever, will change that. The only way I see that could halt the use of renewables is the invention of economical nuclear fusion before renewables become too cheap. And let’s remember, At the moment wind and solar contribute only 3.3% to Germany’s energy use. What a total waste of money and environment it has been. Like I said, ‘zukünftige Musik’. We’ll see in four years when the last nuke gets turned off what all these windmills and solar panels are worth. I’ll send you a cigar when you turn out to be right. An economist who doesn’t understand how a power system and grid works. Solar and wind are designed and sized based on the energy produced over a year. Also either delusional or just a liar about Germany’s current energy mix. His statement, “Coal, oil and gas for electricity make up only a puny 12.8% of German total energy demand”, is completely wrong. Germany is still generating 40% of their electricity from coal and 8.4% from gas but renewables are up to 38 and rising, They are making a bad decision to replace nuclear with coal. Solar and wind are designed and sized based on energy over a year because it’s impossible for them to be designed according to daily and hourly demand. Coal, oil and gas for electricity do make up only a puny 12.8% of German total energy demand – is completely right. Electricity represents only about a third of total German energy need, hence 0.33 x 0.40 is roughly 0.12, right? Learning to read correctly helps. Children living in mud in Africa having their lungs destroyed after walking for miles to find the wood that causes their terrible early death. The can have electricity but only the kind that is totally unaffordable. Murder based on a fraudulent zealotry. Wind energy, that only works occasionally… NOT useful at all. David, you need to read/comprehend better. Don’t mix up ‘electricity use’ with ‘total energy use’. And calling Sinn a liar is totally uncalled for.